Enterprise Monitoring by US Cloud Monitors Any Network, Application or Server. Fix On-Premise or Cloud Issues Faster, Before They Impact Customers. Enterprise Monitoring at US Cloud includes network performance monitoring (NPM) functionality. Network performance monitoring for the enterprise reduces network outages and improves performance. As networks and computer technology become more integrated with business, system outages can seriously impact the bottom line of your enterprise. If your enterprise network or digital property is offline the organization’s productivity plummets. Reliable enterprise network performance monitoring should therefore not only detect system failures when they occur, but also keep track of long term changes in enterprise network performance and usage. Continuous network and server monitoring enables you to find potential problems and resolve them before they become a serious threat to the enterprise. Enterprise monitoring by US Cloud is fast and easy to deploy. Enterprise Network Performance Monitoring (NPM) by US Cloud includes more than 200 sensor types for all common network services (e.g. PING, HTTP, SMTP, POP3, FTP, etc. ), allowing you to monitor your entire network in real time. SolarWinds as a Service is also available for those running SolarWinds on-premises and looking to retire on-premises hardware or extend SolarWinds to monitor cloud infrastructure. Enterprise monitoring (NPM) covers multiple vendors, includes intelligent alerts, network performance baselines and wireless network monitoring and management. 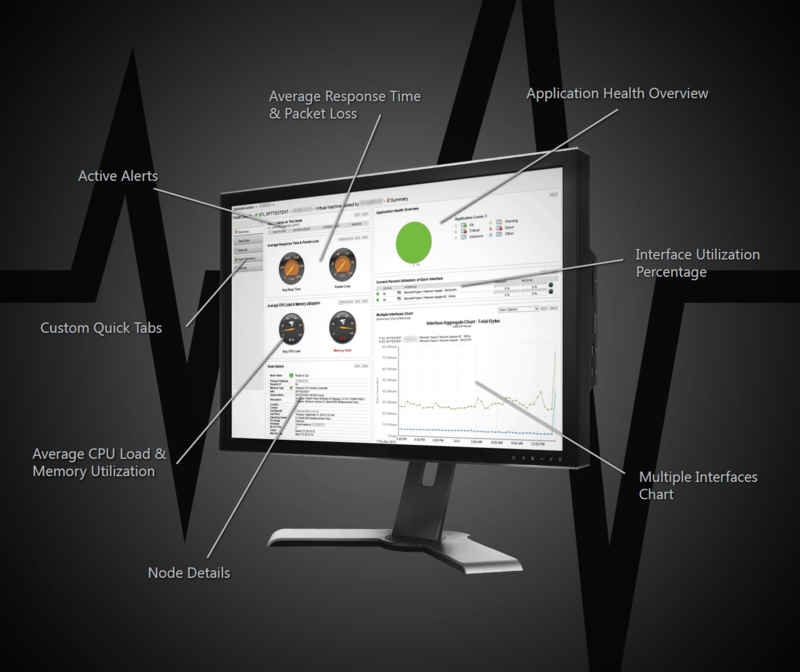 Extend your enterprise monitoring with application performance management (APM). Use enterprise application performance monitoring and management to find bottlenecks, address inefficiencies and speed up performance in your enterprise applications. APM gives you the power to deliver flawless enterprise customer experiences. With enterprise application performance management and monitoring you can improve enterprise application quality and performance at every stage – development, QA, and production. Additionally, you can find bugs faster at every stage of your enterprise application deployment. You can also monitor enterprise application deployments and production performance. Quickly troubleshoot production problems to get enterprise users and customers back online. Another advantage to APM is that by constantly monitoring your enterprise applications and establishing a baseline, you can iterate and learn how to improve your code over time with small incremental, trackable changes. Improve your enterprise code by finding the slowest parts of your application frameworks and dependencies, such as SQL, MongoDB, Redis, and Elastisearch. Quickly identify which enterprise web requests are greatest in volume and greatest in time to execute. Track errors, log traces, and monitor spikes in errors and get notified via email or SMS. Troubleshoot enterprise application problems faster by seeing all the data in one place. View log statements, errors, SQL queries executed, and external HTTP web service calls. Get all your enterprise monitoring application logs from a single view across all enterprise applications and servers. Show full context of errors showing up in your application logs. Log objects and create searchable properties to make logging results more intuitive and useful. Quickly set up enterprise monitoring metrics to track every instance of your Java and Windows applications across all enterprise networks and servers. Easily scale to monitor key metrics for Java, .Net, web application traffic, Tomcat, JBoss JMX MBeans, IIS performance counters and error rates. As you invest in the cloud for greater productivity, intelligence and hybrid capabilities, you need a comprehensive enterprise cloud monitoring solution to extend the stability of your legacy enterprise network to multi-cloud infrastructure. Manage your enterprise resources and cloud providers for successful cloud monitoring and ROI. See executive overview dashboards or deep dive for a comprehensive view into the health of your enterprise cloud deployment. Our built-in automation provides comprehensive enterprise monitoring strategy for your cloud deployment in AWS or Azure. Monitor everything in your enterprise and maintain data continuity as you transition to the cloud. View historical data or live real-time data across your hybrid enteprise environment to forecast and make better informed decisions to maximize your cloud ROI. Enterprise Cloud Performance Monitoring at US Cloud eliminates blind spots giving you total control of your cloud migration. Understand where the enterprise is spending the most money and optimize your costs to get more out of the cloud. Know about enterprise service disruptions before your cloud provider notifies you. Track availability and latency of your enterprise’s cloud providers to hold them to their service and financial SLAs. Get alerts on enterprise cloud resources before you “hit the wall.” Increase service availability and deliver better web experiences for your enterprise customers by proactively managing your cloud resources. See how your enterprise cloud resources are performing by OS or application. Analyze trending to dial enterprise resources up or down for better ROI. Avoid over-subscription and wasted enterprise cloud investment. Overlay enterprise service configuration change timelines with cloud application performance to reduce issue to resolution time and improve enterprise change management for your cloud resources. On-premise enterprise monitoring tools usually require more time and money to deploy due to the need to purchase and configure new hardware and dedicate enterprise staff resources to installing the software. Analysts consider SaaS based offerings like Enterprise Monitoring at US Cloud critical for long-term enterprise success. Outsourced Enterprise Monitoring services from US Cloud is highly-available, fast and scalable. On-premises enterprise data center, maintenance and staff overhead can’t compete from a cost perspective. Enterprise monitoring tools purchased outright may introduce budget spikes as the number of devices grow in your enterprise IT environment. Surges in traffic or demand may also cause sudden cost increases. Enterprise Monitoring at US Cloud is delivered pay-as-you-grow so costs are predictable and scale easily. Monitor your entire enterprise IT ecosystem including distributed hybrid, private cloud, public cloud, co-location, and on-premise. Get seamless, unified monitoring, regardless of geographic location or deployment model: on-premise, virtual or cloud-based. On-premise enterprise monitoring products share a point of failure with the enterprise IT systems they monitor. During an outage, enterprise monitoring is needed most to expedite troubleshooting and recover as fast as possible. Isolate monitoring via US Cloud Enterprise Monitoring to ensure your teams have the tools they need to assess the situation and restore enterprise operations. Change in enterprise technology is outpacing operations teams’ abilities to keep up. There is no greater example than an already short-staffed enterprise IT operations team trying to monitor a growing hybrid infrastructure while be pushed rapidly to the cloud, AI, IoT and Blockchain. Coordinating enterprise monitoring across IT operations, DevOps and security teams is a distraction for high-value enterprise resources. Security is built into the DNA of US Cloud Enterprise Monitoring as customers are isolated from one another logically and/or physically. All traffic occurs over HTTPS using TLS encryption with SAML, whitelisting, and role-based access control and access logging. 24/7 NOC with global data centers offer the availability enterprises demand. Similar security in an on-premise enterprise environment is possible but not economical or practical. Monitor all IT devices on your entire enterprise network, even if they are spread across the globe, in many data centers or customer environments. Enterprise technology vendors supported include: Aerohive, Aruba Networks, Avanu, Barracuda, Blue Coat, Brocade, Buffalo, Check Point, Cisco, Meraki, Citrix, Coyote Point, Dell, Expand Networks, Extreme Networks, F5, Fortinet, HA Proxy, Juniper, Kemp, Palo Alto, Sense, QNAP, Quantum, Riverbed, Sonicwall, Synology, Watchguard, Xsigo Systems, and more. Easily integrate with your enterprise IT ecosystem or build a custom integration with our open API. Power up ServiceNow with enterprise monitoring integration to identify problems faster and give a better overall customer experience. Deliver visibility across all your enterprise infrastructure and devices. Integrate US Cloud enterprise monitoring with Stride for better collaboration and faster troubleshooting. Improve enterprise communication while speeding up time to resolution. Allow your Puppet infrastructure to manage your enterprise monitoring at US Cloud. Ensure consistency across all your enterprise infrastructure and teams.